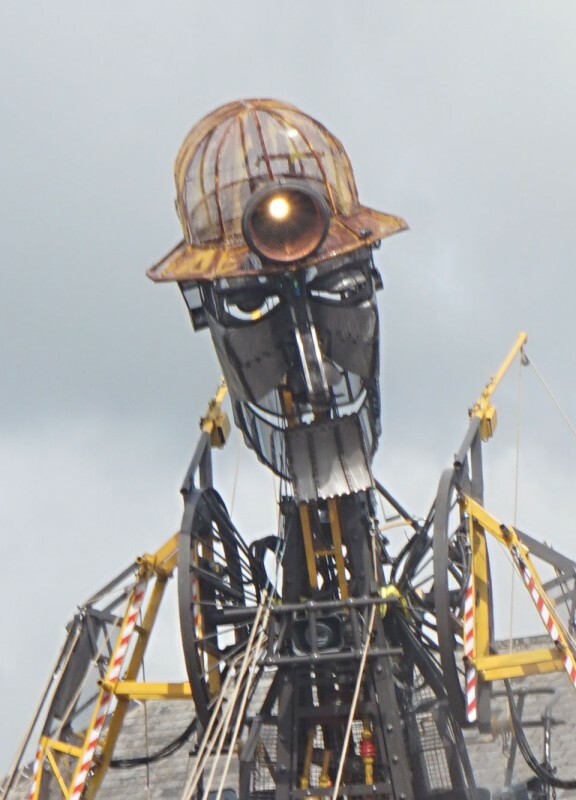 The Man Engine is a monstrous Cornish Miner, created in puppet form, and riding like some vast god-figure on the back of a monstrous Volvo lorry. We went to see him unveiled in Tavistock a few weeks ago, at the start of his trek westward through Cornwall. I just unearthed some photos. 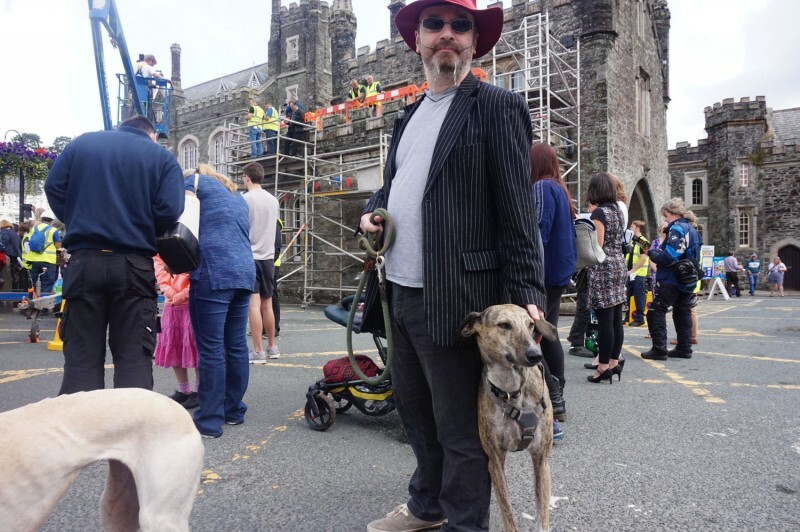 We took the hounds with us: I might not have done that if I had realised how busy it would be, but Brythen feels quite safe when he has Pp to lean on, and Rosie seems untroubled by crowds (so strange. This is the dog that was terrified of a falling pencil on the other side of the room). I photographed the photographers arriving and going up onto the scaffolding prepared for them. 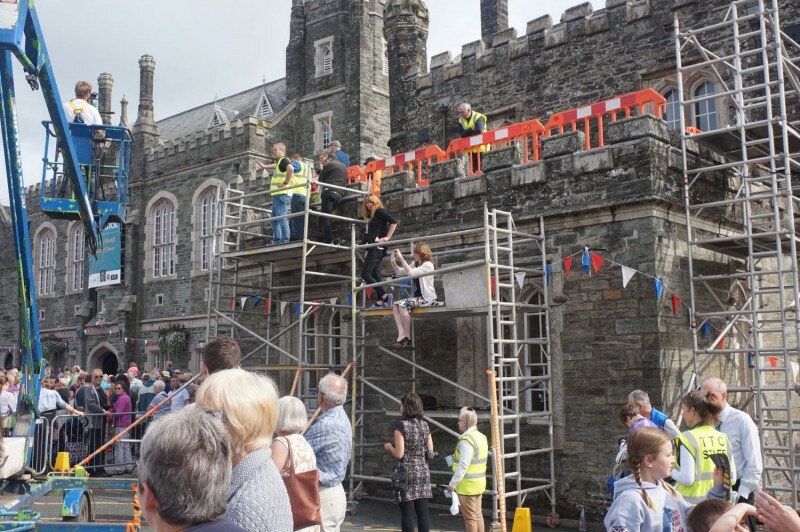 I particularly like the lady in the demure skirt and heels, who none the less climbed the scaffold with monkey-like skill. To get the Man Engine to stand up, you are supposed to sing to him : Sten Sten Sten! which is Cornish for tin, and there was quite a long song in Cornish to go with it. But this was in Tavistock, and while Tavistock is certainly the most easterly of the Mining World Heritage site, it is also quite undeniably just over the border in Devon. Nobody speaks Cornish! 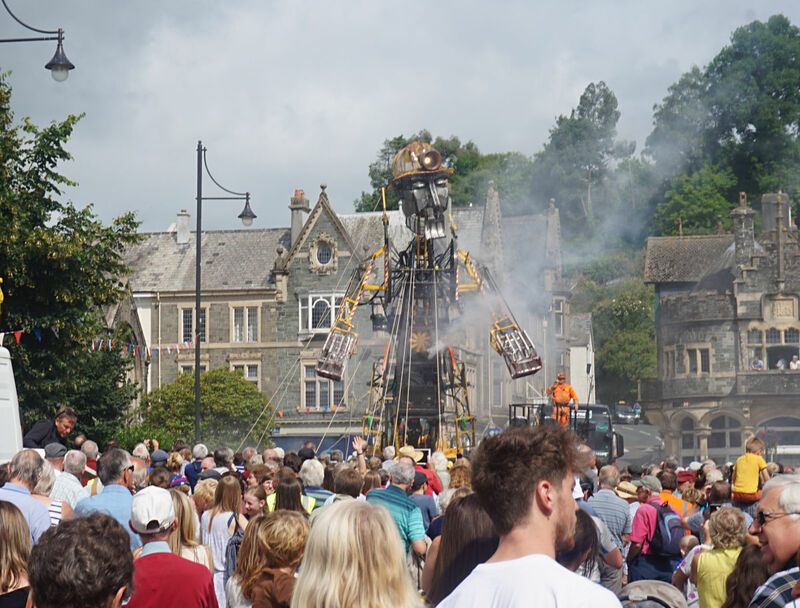 Some people sang (I think the town council had arranged a choir) but most of the surprisingly-huge crowd just watched, while the little orange guy you can see below told us partially-audible tales of mining past, then the choir sang and the Man Engine stood up! Frankly, he looks pretty damn scary and I was a little surprised that none of the small children present seemed alarmed. I was alarmed! We didn't rush away afterwards, since the Man Engine was due to leave on the same road that we use to get home, so we thought we'd stay and have some lunch (the hounds had a burger in a bun between them). This meant that because the Man Engine took a long time to get going, we ended up as the first car behind the giant lorry! Fortunately it didn't go as slowly as I'd feared, since the Man Engine was all bundled up to fit under the low branches in the lanes. And people came out with Cornish flags to see it and wave it on its way, all the way over Gunnislake Bridge and up to Drakewalls mine, its next stop - although it wasn't able to stand up there, because the mine adits are very close under the surface at Drakewalls, and they didn't want to risk shifting things around to much on the top of them. Did you sing? Hard to tell from your vid how many did? We didn't quite have the nerve because most people were a bit 'we're not singing in Cornish, this is DEVON' in Tavi. :-D Although we did get a good chant of 'STEN STEN STEN' going. Cool! And Pp and Brythen look very good together. By the way which dog got the bun and which the burger? Ah, it was fairer than that! We cleft the burger in twain and both dogs got both bun and burger (and very pleased they were too). It is totally Ritual, no Probably about it! I don't know what they will do with him in the end though. I think our mines are mostly a bit past the fruitful stage!